In this episode of the podcast, Kevin gives a few tips on how to detect whether or not you have phasing problems in your mix. 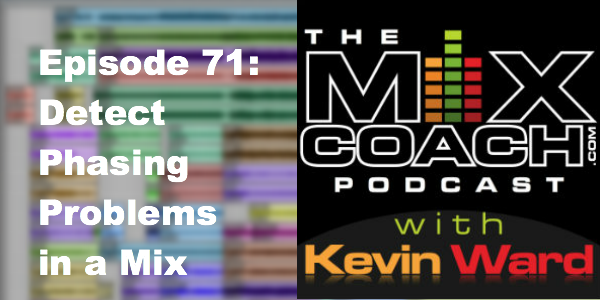 Jon Wright: This is the MixCoach Podcast, Episode 71. Kevin Ward: On this episode of the MixCoach Podcast, I’m going to show you two surefire ways that something in your mix is out of phase. Man 2: Now you can get the training, tools, and community you need to achieve a better mix and workflow. Man 1: MixCoach Member is a growing community of versatile mixers, led by award winning engineer producer, Kevin Ward. Man 1: Downloadable session files, so you can build your confidence and hone your mixing skills. Mix tutorials, so you can see how a pro mixer approaches each month’s new mix. The forum, where you can get real-time feedback on your mix from a huge community of mixers, just like you. Man 2: Members Only webinars, where you can get your questions answered and get advanced training. Man 1: Plus hours of mix critique videos, so you can see what the MixCoaches say about the monthly mix submissions. Steve Borden: Hey, it’s Steve Borden from Los Angeles, California. I’m a MixCoach member. I’ve been involved since its inception and my game in mixing has elevated greatly due to the excellent tracks provided, the feedback, and the community. It’s a great group of people. If you’re thinking about joining MixCoach Membership, and you have any question or any hesitation, just do it for one month. MixCoach will start you on a course that will only elevate your game in mixing. Man 2: Become a more confident mixer now. Man 3: Go to MixCoachMember.com. Jon Wright: Hey, Kev we’ve talked a lot about phase on both the nonmember site, as well as on the member site. And I just wanted to address it a little bit on the podcast here. In a webinar it was a couple of weeks ago, we had the question posed to us, “How can you tell something is out of phase, aside from the crazy kind of shifting, phase shifted, phasey sound?” So whenever you’re mixing through something, how would you know whether the snare is out of phase with like the overheads and things like this? Just talk about that for a little bit. Kevin Ward: Well, you know, when you talk about phasiness, I have rarely ever heard a phasey sound that told me something was out of phase. Kevin Ward: That I didn’t think should be there because usually you run things through a phaser and it’s kind of what it does. Kevin Ward: That’s very nice. There’s our whizbang plug-in number one right there. No, but the biggest indicator to know that something is out of phase, in my opinion, the biggest plug-in you can use is the mono switch on your monitors. Kevin Ward: Boom. No, the boom switch is something different. The mono switch is probably the most underutilized environment that you can put your mix in. My interns when they start here they say, “Why do you mix in mono so much?” And I know I’ve talked about this to my members too, but the reason is you mix in mono to hear the absolute worst case scenario that people are going to be listening to. And they say, “Well, nothing is ever . . . nobody listens in mono anymore.” And I said, “Really? Come over here with me. Okay, let’s leave this music playing.” And then I take them to another part of the studio, and I’ll say, “Now tell me which is right and left.” Because it’s mono. Kevin Ward: If you’re listening to your truck speakers at a tailgate party chances are you’re listening to it in mono. So things are in mono, mono is very real world. So the biggest indicator, I’m saying this wrong I know, but the biggest indicator that something is out of phase is that it sounds “thin” in mono. And what happens is you’ve got the left speaker, or the left signal, and the right signal, and if one is pushing the speaker out simultaneously while the other one is pulling it in, if it’s in stereo you won’t hear it. It’ll just sound wide. But if it’s in mono, they will cancel each other out because the sum of a waveform going up and a waveform coming down at the same time is zero. So it’ll sound thin, now in most cases it’s not 100% or 180 degrees out of phase. Kevin Ward: Usually it’s out of phase somewhat. Which if you’ve got a big hefty kick drum spike, we’ve all zoomed in, if you’re listening to this podcast, you’ve probably zoomed way into a waveform. Kevin Ward: And you know how big and fat and wide those low end waveforms are. So those are the biggest, the low end is where you’re going to hear the most phase cancellation. Kevin Ward: So you’ve got one signal canceling the phase of another signal. Kevin Ward: Or kind of subtracting volume from it. Kevin Ward: Basically I guess is a good way to talk about it. So a lot of guys ask, “So when does this happen?” It happens any time you’ve got multiple microphones on any instrument. Kevin Ward: It can happen any time. For instance if you’ve got an inside kick drum and an outside kick drum. Or the best scenario would be when people mic a drum kit, you’ve got two mics above the drum kit. Kevin Ward: Are those mics in phase completely? Probably not because, time the distance from the snare to the microphone, if it’s different from each mic, then it’s going to be somewhat out of phase. So listen to it in mono and just in AB whether one side in or out of phase is going to sound better than the other. Kevin Ward: Then you’ve got all the individual things coming in there like the snare drum, the kick drum, all the toms, if they’re reaching those mics at different times, and they will be because you’ve got one mic really close to the snare, and then you’ve got another mic that you’re using significantly loud of the overheads and are they in and out of phase? So the best way to tell, the absolute best way to tell, is just to do two things at a time. The overheads and the kick, put it in mono, flip the phase of the kick, more often than not, one will sound bigger than the other. Sometimes it’s a taste thing. Jon Wright: One that’s a little bit more out of phase just because you like it better with the song. Kevin Ward: Let’s just say you’ve got a sparse track and the drums need to sound huge, then you might go for the in phase kick sound that’s just really big and hefty in mono. And then you might have a track that’s real orchestral and same kit, same mic’ing and everything, and you may choose to use the out of phase signal because you want it to sound a little tighter. Kevin Ward: That’s an extreme scenario. Jon Wright: That’s an scenario. Yeah. Kevin Ward: Usually that’s the one that’s in phase with the rest of the mics. Jon Wright: Or something drastic like that, if you check on the phase, you might be able to solve the issue. Kevin Ward: Absolutely. More often than not, that is the problem. Okay, here’s two indicators that you’ve got something out of phase. If something sounds “thin” when it’s in mono, but it sounds fine when it’s in stereo? It’s out of phase, more than likely. If something disappears in the mix in mono, and it sounds fine in stereo? It’s usually out of phase. That’s the two biggest indicators that something’s out of phase. You will rarely ever hear a phasey sound that something’s out of phase, unless there’s a microphone moving. Kevin Ward: Or something like if you’ve got somebody actually moving a mic in real time. Jon Wright: Or moving closer to or further away from a microphone or stuff or something like that.